This article is about the American civic holiday. For the Quebec holiday, see National Patriots' Day. For the anniversary of September 11, 2001, see Patriot Day. For the 2016 motion picture about the Boston Marathon bombing, see Patriots Day (film). In 1894 the Lexington Historical Society petitioned the Massachusetts State Legislature to proclaim April 19 as "Lexington Day". Concord countered with "Concord Day". Governor Frederic T. Greenhalge opted for a compromise: Patriots' Day. However the biggest battle fought on this day was in the town of Menotomy, now Arlington, Massachusetts. Menotomy was on the Concord Road between Lexington and Concord and Boston. While the fighting was going on in Lexington and Concord, 5,100 militia men arrived in Menotomy from Middlesex and Essex Counties. These men took up positions along the road the British troops would take on their retreat to Boston. They placed themselves in and around houses, stone walls, fields and barns. The bloodiest fighting of the first day of the American Revolution took place inside a single house, the Jason Russell House, in Menotomy. Eleven militia men died in this house fighting British troops trained in bayonet fighting. Patriots' Day was first proclaimed in Massachusetts in 1894 by Gov. Greenhalge replacing Fast Day as a public holiday. The idea was introduced to the Governor by the statesman from Lowell, Isaac Henry Paige. 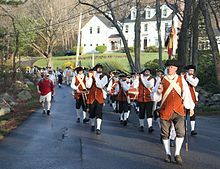 It was established on April 19, commemorating the date of the Battles of Lexington and Concord and the larger Battle of Menotomy in 1775, and consolidating the longstanding municipal observances of Lexington Day and Concord Day. It also marked the first bloodshed of the American Civil War in the Baltimore riot of 1861, during which four members of the Massachusetts militia were slain and 36 injured. In Menotomy, now Arlington, 25 militia men died and 40 British soldiers were killed. The dual commemoration, Greenhalge explained, celebrated "the anniversary of the birth of liberty and union". It is likely that the battles that took place in Menotomy are not as well known as the smaller battles in Lexington and Concord because the town has had several names since that day in 1775. In 1938, with the generation that had fought in the Civil War largely off the voter rolls, the Massachusetts legislature passed a bill establishing the holiday "in commemoration of the opening events of the War of the Revolution". 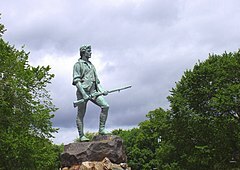 Observances and re-enactments of the battles occur annually at Lexington Green in Lexington, Massachusetts (around 6:00 am) and the Old North Bridge in Concord, Massachusetts (around 9:00 am) and in Arlington, Massachusetts on the Sunday before Patriot's Day. Tours are available of the Jason Russell House in Arlington, Massachusetts on Sunday and Monday. On Monday morning, mounted re-enactors with state police escorts retrace the Midnight Rides of Paul Revere and William Dawes, calling out warnings the whole way. ^ a b c Sampson, Rob (July 13, 2017). "Patriots' Day Becomes Official Statewide Holiday!". State Representative Rob Sampson. Wolcott, Southington, Connecticut. Retrieved November 27, 2017. ^ "Battle of Menotomy - First Blood, 1775". HistoryNet. May 6, 2010. Retrieved April 15, 2019. ^ "The Battle of Menotomy". Arlington Historical Society. July 4, 2012. Retrieved April 15, 2019. ^ Kinney, Jim (April 15, 2018). "Patriots' Day 2018: What's open, what's closed, details on extended tax deadline, Boston Marathon, MBTA service and more". MassLive. Advance Local. Retrieved April 25, 2018. ^ "Jason Russell House". Arlington Historical Society. July 5, 2012. Retrieved April 15, 2019. ^ "News | Town of Arlington". www.arlingtonma.gov. Retrieved April 15, 2019. Wikimedia Commons has media related to Patriots' Day.